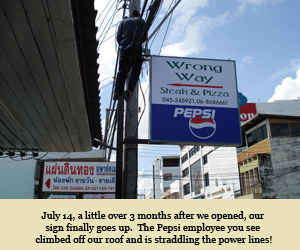 We opened Wrong Way Cafe on April 7, 2006, so we are approaching our 6th anniversary. Opening Wrong Way Cafe was a fairly casual affair. I have a passion for cooking, drinking beer, and playing pool. There was a dearth of suit able venues in town back then. There seemed to be a probable need for an expat meeting place, one that didn’t play deafening music or was otherwise inhospitable. The need was “probable” because I had only myself upon which to base the assumption. I figured I could pay the rent, so at worst it would be an expensive hobby. It turned out that I wasn’t the only one who wanted a place with counter to lean on, a pool table, cold beer, and expat camaraderie. For months we only sold drinks. In the meantime, I built a barrel vault wood fired oven as I hoped to provide authentic pizza and bread. One of my many character flaws is an exceptional ability to take on projects that are almost, but not quite, beyond me. 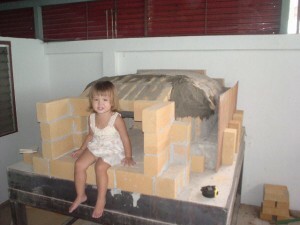 Building a masonry oven as they’ve been built for centuries in Europe and North America is no simple task. It took me months of time and truckloads of beer. I imported a San Francisco Sourdough starter and got it active. We still use the same leaven today. Our bread gradually progressed from frightening, black, rugby ball shaped lumps to frightening, brown, almost bread like items, otherwise known as rustic bread. The problem with one of these ovens is that you can’t just turn it on when somebody orders pizza. Pizza in one of these contraptions is an all or nothing kind of thing, and given the heat it produces in an already high ambient temperature environment, you would soon find that your own body mass has shriveled down to almost nothing. So, the sign in the photograph above is an artful work of false advertising. We don’t have pizza. I’ve often contemplated getting up there, straddling the power lines myself, and adding a “no” between “Steak &” and “Pizza,” but with a name like Wrong Way I think we can continue getting away with it. Besides being used to bake bread a few times a week for our own sandwiches, the oven comes in handy when we have special events, such as our Christmas Eve Buffet. There are not a lot of other options for cooking 4 turkeys at one time. Gradually our menu has evolved to mostly straightforward Thai and Western dishes. Off the top of my head, I’d say our Wrong Way “Signature” Burger, Fish & Chips, and Bangers & Mash are our most popular items. We at Wrong Way Cafe are masters of underachievement. We try to maintain an easygoing atmosphere with good food and acceptable service (I used to say of our staff, “If you can’t get their attention, they are probably just ignoring you,” but they continue to improve). We are open every day from 4:00 p.m. until, usually, after midnight. The kitchen closes at 10:00 p.m.